Warsaw is a living example of European resiliency. Almost completely destroyed by the Nazis as they lost grip of Poland at the end of World War II, the entire city’s buildings were rebuilt to minute detail. I recall a postcard I saw years ago of Old Town’s rynek that had a picture of the remains of a house in which only the arches were left intact. Today, that exact place – now an Italian restaurant – has been fully restored to its former glory as if nothing had happened to it… an example that could have been followed by New Yorkers after 9/11 if it weren’t for the politics that have left a hole in the ground for nearly a decade. We arrived in Warsaw in the late afternoon after almost four hours in the back of a packed minibus and walked to our hotel, which was just a few blocks from the spot where our driver dropped us off. We had booked the Mercure Warsawa Grand http://www.orbis.pl , a beautiful and modern hotel located in the City Center. Exhausted from the trip, we ate the sandwiches Renata’s mother prepared for us that morning, and proceeded to lie down and rest. After all, if we were at Eastern Europe’s nightlife capital, we might as well check out what was going on that Friday night. The rain was still relentless after a week, but at least the forecast for the next day was for warmer weather and clear skies. After connecting our trusty laptop, I logged on to www.warsaw-life.com (a highly helpful website that contains information about practically everything you need to know there – they also have versions for Krakow and Zakopane, which I also used) and proceeded to make plans for the evening. I immediately ruled out places that reviewers wrote negatively about, and around 10 PM we set out to find a place to have a drink at. We initially chose a pub a few blocks away from our hotel, but since no one seemed to know where it was (the street had a weird numbering system), we gravitated to a dive called Shot and Go (no website), where vodka shots and glasses of beer went for about PLN 4 each (that’s about $ 1.25). A small place with a smoky atmosphere comparable to the pubs I saw in Paris, it is frequented mostly by college students and foreign visitors. We would up staying there for quite some time and chatted (Renata serving as an interpreter) with the bartenders and people who stopped by, and around 2 AM we headed back to the hotel, stopping at a 24-hour kebab stand for some late-night munchies. We woke up the next morning and were glad to finally see blue skies. We had breakfast at a small place nearby. We then began walking towards Old Town, one of the city’s main tourist attractions. As we made our way, we came upon a museum dedicated to the Polish Army Museum http://www.muzeumwp.pl/o-muzeum.php, a space dedicated to the country’s military history. Outside, we saw many airplanes and tanks used during several conflicts, especially those used by the Polish resistance during the Nazi occupation. It was an eye-opening experience for me, since I had never seen MiG fighter jets up close before or any other equipment made during the Soviet era. After about an hour, we proceeded down to our destination, and stumbled upon a street fair where lots of merchandise and food were being sold. 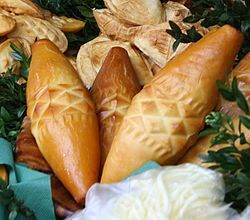 At one place, they were selling grilled Oscypek, a kind of cheese made from unpasteurized sheep’s milk in the Tatry mountains (we also found an elderly lady selling that near the train station in Krakow). We sampled some artisan-produced beer (where we met a Brazilian tourist) near the local Starbucks, and I had smalec – a spread made from lard, some herbs, salt and pepper served on a slice of rye and topped with pickles. It was the first (and only) time I ever ate anything made from lard – but it was surprisingly tasty and filling. We then visited the local central market, where we also bought pierogi a handful of souvenirs and after that we found the rynek where one the city’s famous statue of a siren is located – and also the aforementioned restaurant whose photo had been burned in my memory all those years. We also saw the Royal Castle, but chose not to go inside at this time. After making a stop at a small café where Renata had some gofer (a cream-topped waffle), we paid a visit to Jimmy Bradley’s Irish Pub for a pint (where we met a couple of backpacking Aussies with whom I had a flaming shot of slivovica). Finally, we took the tram back to our hotel. Warsaw is well served by public transportation, with a network of trams, buses and a subway line that can take you anywhere. At the hotel, rested for a few hours and later that evening met with a group of Renata’s classmates from Chelm who now live in Warsaw. They took us to two of the city’s most trendy locations: the first stop was Szlafrok http://www.warsaw-life.com/drink/pubs_cafes_details/186-Szlafrok , an upscale pub in the City Center, where the bartender assured us we would have the best caipirinha in Warsaw after I asked him if he knew how to make it (he delivered). We then went over to Lemongrass, a bar/restaurant really close to our hotel that specializes on Asian-fusion cuisine, where an entire crew of Chelm transplants showed up. They all spoke excellent English, so I didn’t feel like the odd man out. Around 1 AM some of us returned to Shot and Go for a nightcap, and then we said our goodbyes. The following morning we woke up hung over and pretty much prepared to head to Warsaw airport. Our taxi came, and as we arrived we checked into our KLM flight to Amsterdam, where we would meet our plane back to New York. In Amsterdam, we checked out the duty free shop, where I got a bottle of aquavit (unfortunately we couldn’t purchase anything at Warsaw airport due to security issues there). The flight went without a hitch, except maybe for a family with two loud kids who wouldn’t keep quiet during the entire way. I turned twice to ask the father to do something about it, but it was pretty much useless. KLM’s service was impeccable, though – they kept us well fed and reasonably comfortable, so we were not at all hungry when we reached JFK. On our final day off on Monday, we unpacked and prepared to resume our daily lives. 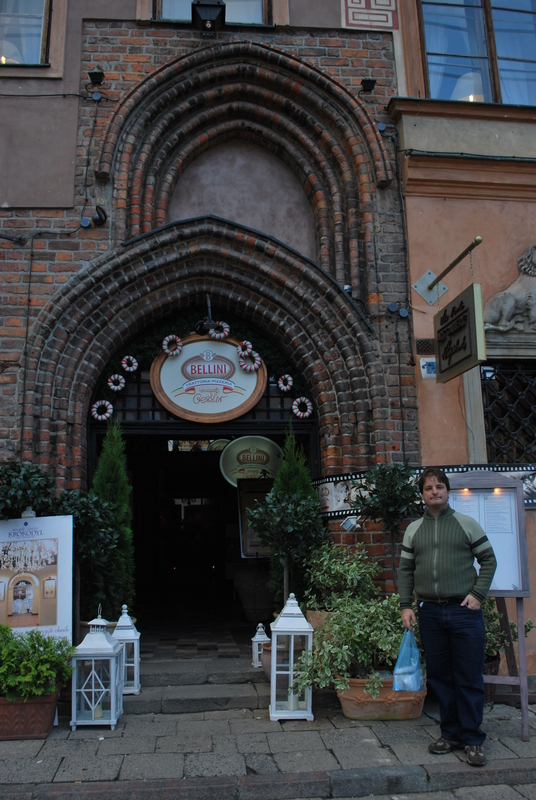 Poland was a great discovery (at least for me), and I would surely like to get to know that country better. Great series, really enjoyed every moment. Man, it’s nice to have gone around with you this time. Poland IS a great discovery. I enjoyed your blog about a trip to Poland. Now that I’d like to visit there.